One of the older independent bottlers is Silver Seal out of Italy, which has been around for longer than many other such companies; it was formed in 1979 and named “Sestante” before being renamed in 2001 after a ten year operational hiatus. It adheres to the modern ethos of regular issues, and bottles casks sourced and aged with attention to detail, from all over the world; it takes an approach more akin to Rum Nation or L’Esprit than Velier, diluting the natural strength of the cask to appeal to a broader audience….though as this Enmore demonstrates, they have no objection to issuing cask strength rums either. Like Samaroli they do primarily whiskies, with rums as a smaller percentage of their sales, but I argue that it is for rums they really should be known, since everyone and his chihuahua makes whiskies, but it takes a real man to make a good rum worthy of being called one. 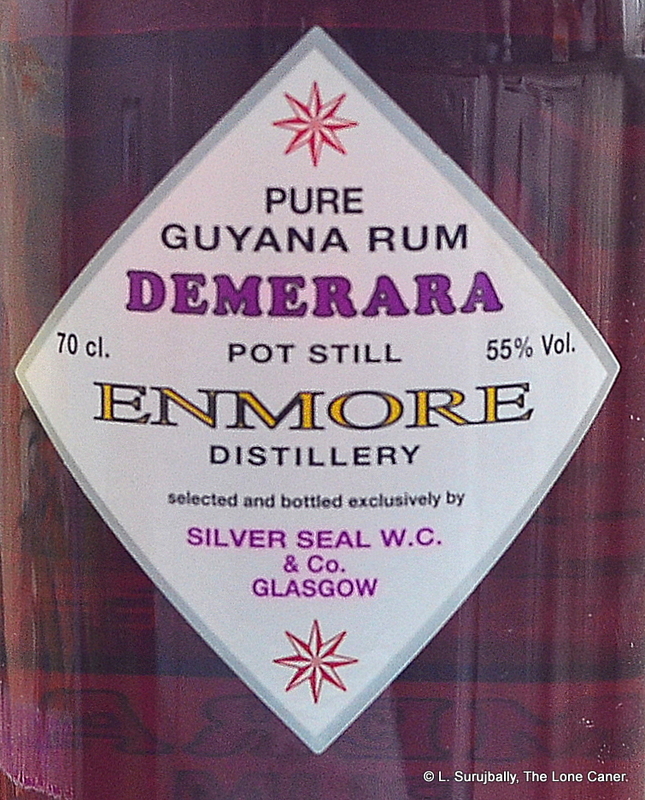 The Enmore we’re looking at today presses all the right buttons for a Guyanese rum from the famed still, about which by now I should not need to spill any further ink. Distilled in 1986, bottled in 2007 at 55%, no filtration or dilution, and that’s enough to get most aficionados drooling right away. Price is a bit much — I paid north of €300 for this bad boy, largely because getting any rums from the 1970s and 1980s these days is no easy task and when one is found it’s pricey. Colour was copper-amber and after having waited eight months to crack the thing, well, you’ll forgive me for being somewhat enthusiastic to get started. Fortunately it did not disappoint. Indeed, it impressed the hell out of me by presenting a nose with three separate and distinct olfactory components, which somehow worked together instead of opposing each other. It opened up with a trumpet blast of tart red apples (almost cider-like), acetone and polish and burning rubber, and frankly, I wish I knew how they made that happen without messing it all up, so points for succeeding there. The second component was the more familiar licorice and dried fruit and black cake, lots and lots of each, which gradually melded into the first set. And then, more subtly, came the third movement of softer, easier, quieter notes of coffee, chocolate, vanilla, smoke and leather that lent authority and elegance to the more powerful statements that had come before. In fine, a great nose. I went on smelling it happily for half an hour (and on three separate occasions). And the taste…”warm and powerfully elegant” is not a bad four-word summary. Again I was reminded how 50-60% seems to me to be just about right for rums to showcase strength and taste without either overkill or understatement. It takes real effort and skill to make a 65% elephant perform like a dancing cheetah (Velier is among the best in this regard, with the Compagnie and L’Esprit snapping lustily at its heels) but for something a bit less antagonistic like 55%, the task is commensurately easier. That worked fine here. It took the flavours of the nose and built on them. First there were salty marshmallows and teriyaki, not as obscure or crazy as it sounds (more a way to describe a salt and sweet amalgam properly). It had the slightly bitter taste of unsweetened coffee and dark chocolate, but was also remarkably deep and creamy, though I felt here the wood had a bit too much influence and this jarred somewhat with the following notes of caramel and butterscotch. But with a bit of water the dark fruits came out and smoothened out the experience, gradually morphing into a sweeter, more relaxed profile, salty, briny, musky and with a flirt of cereals and raisins. Overall it was a lot like the Compagnie’s Enmore 1988 27 year old, so much so that the differences were minor (for the record I liked that one more…it had somewhat better depth, complexity and balance). Things were wrapped up nicely with a finish of heated warmth, reasonably smooth and long, which summed up what had come before and was primarily licorice, raisins, vanilla, brine and burnt sugar. All in all, an impressive achievement. Independent bottlers aren’t producers in the accepted sense of the word, since they don’t actually produce anything. What they do is chose the base product, and then transform it. Some, after careful consideration and exacting decision-making, buy the finished rum by the individual barrel from a broker and put a label on, while others take the time to age their own barrels of raw rum stock bought young. I’m not entirely sure which camp Silver Seal falls into, but I can tell you this – whatever they did to put this rum out the door is absolutely worth it. It’s one of the better Enmores I’ve tried and if you do empty your wallet to buy one, I don’t think you’ll be disappointed either. 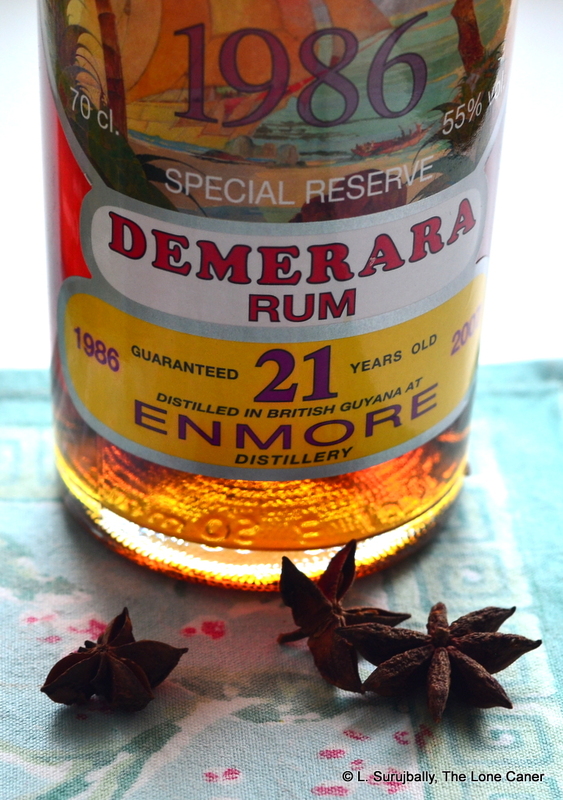 Allow me a digression to snark for a moment: the company both elicits my admiration for their bottlings and my annoyance for the crap labelling of their Demeraras in about equal measure. It’s all about that ridiculous British Guyana moniker they keep slapping on, which is about as irritating as reading “Guyanan” rum on a Cadenhead bottle. All right, so that’s petty of me, but please, just get it right folks, is all I’m asking. Guyana has been independent since 1966 and by now everyone should know it’s no longer “British” anything, and when it comes from there, it’s a “Guyanese” rum. 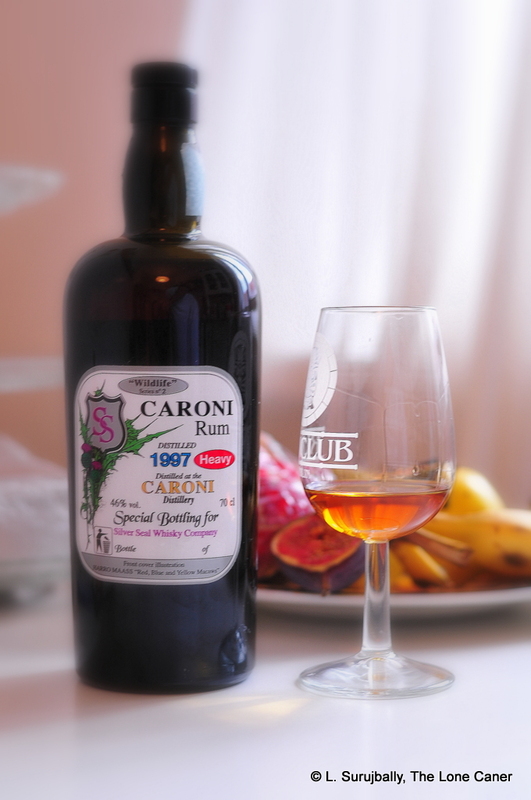 A surprising, dry, sharp and flavourful rum, yet somewhat missing of the high bar set by the Caronis made by other Italians. It’s got too many conflicting components, good in themselves, failing to cohere. Readily available, cheaper and often excellent “everyone has one in his bar” rums dot the North American reviewing landscape, and every blogger usually begins his or her writing with such standards (European bloggers like Cyril, Marco and Henrik do not, for other reasons). Just like all film lovers eventually come to Ozu, sooner or later all us web scriveners move towards the craft bottlers, and with good reason. These makers take a select set of barrels from a particular country, a favoured distillery — even a specific still — and then lovingly tend the result without the problems of mass producing massive amounts of rum for an export market. These are almost always – and probably always will be – somewhat niche products, created for the rabid, not the mainstream, and alas, they tend to be pricey, if available at all. I think it’s a crime that more of this craft stuff doesn’t come over the water…even Renegade Rums are a vanishing breed over the pond. Add to that that this is a Caroni, and that says all that needs to be said as to why I bought it (for €80). Depending on how you order the words on the label, this rum is called “Silver Seal Fine Caroni Heavy Rum 1997” with an additional moniker “Wildlife series No. 2” which relates to the label illustration of “Red, Blue and Yellow Macaws” by Harro Maas (several other Silver Seal rums have such designs). Given that it was marked as being bottled in 2011 on the label, then it is a 14 year old rum, even if it is not stated outright as being such; and like many other independent bottlers, they diluted the rum with distilled water down to 46%. Black tipped cork on a standard barroom bottle, which held a golden-brown rum inside. As I noted before with the Bristol Spirits and Barangai Caronis, there were certain things I expected from the rum, and here I found some of them returning like well-regarded, familiar friends on holiday, others not. The nose started off somewhat lightly, with cherries and white flowers, but after just a few minutes the heavier flavours began to marshall their attack: tar, leather and smoke began, with estery wax and rubber notes of squishing wellies charging in later. 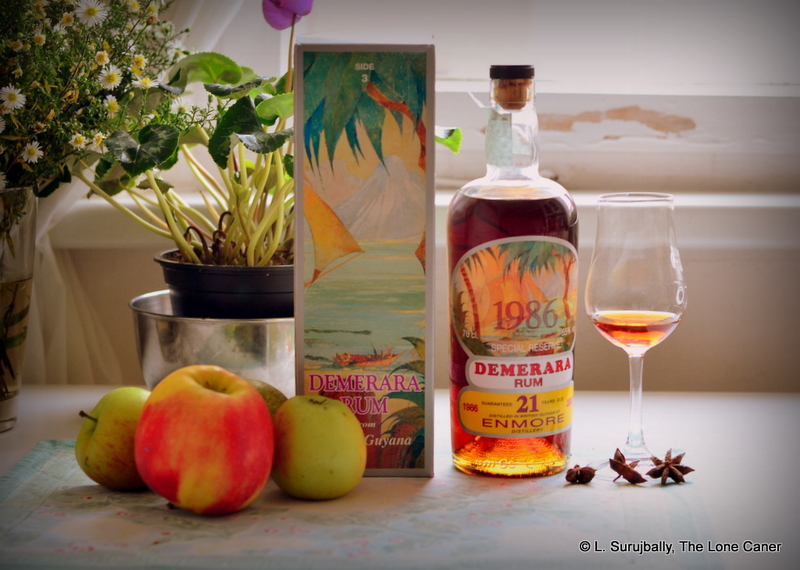 It was hot and spicy throughout – somewhat surprising for a rum of such relatively modest proofage. And yet, as I stuck with it (and re-tasted later), the sweet flowers returned, accompanied by aromatic soap, citrus and – get this! – bubble gum. A bit light, overall, and very rich in complexity and flavour. No milquetoast rum this, it displayed real heft and weight to the taste. Salty, briny and spicy, with tar, jute rice bags and heavy burnt sugar notes present, without the rum ever actually becoming sweet. Oak and smoke abounded, plus black dripping engine oil from a leak under your car, cooking on the asphalt on a really hot day. Alas, these notes on the palate did not reach the high standard set by the initial scent. Adding some water didn’t quite rescue it, but did allow other flavours of vanilla and green olives to emerge. The rather lacklustre finish of salted peanuts, butter and caramelized sugar was more of a question mark than an exclamation point on a unique rum which didn’t come together properly – I think too many interesting and complex flavours were at work (and querulously interfering with each other) for me to really love it. The nose was great, the palate pretty good and the finish just…meh. In a way it was a kinda crazy amalgam of taste impressions, not all of it succeeding as it should. Silver Seal is a bottler much in the vein of Velier, Rum Nation and others, if perhaps older (they were formed in 1979 and named “Sestante” before being renamed in 2001 after a ten year operational hiatus): like them, it bottles casks sourced and aged with attention to detail, from all over the world; like them, it is based in Italy; unlike Velier it does dampen down the natural exuberance of the cask, perhaps to appeal to a broader audience. Its website gives equal, if not more prominence, to whisky (drat! ), which I have to admit may not be all bad – love of the product does not blind me to the fact that flogging rums in the shops of the world can be an uphill slog, so if their whisky sales allow them to continue producing rums, well, that’s all good. Summing up, I enjoyed the rum, just not as much as other Caronis I went through in series that day. This one is a shade too dry and salty – and maybe harsh – in comparison to those. Oh, it’s a country mile ahead of cheaper and more available Trini rums, and there’s no denying its complexity (and the taste which single malt Islay lovers will really drool over) — so points for its technique there. 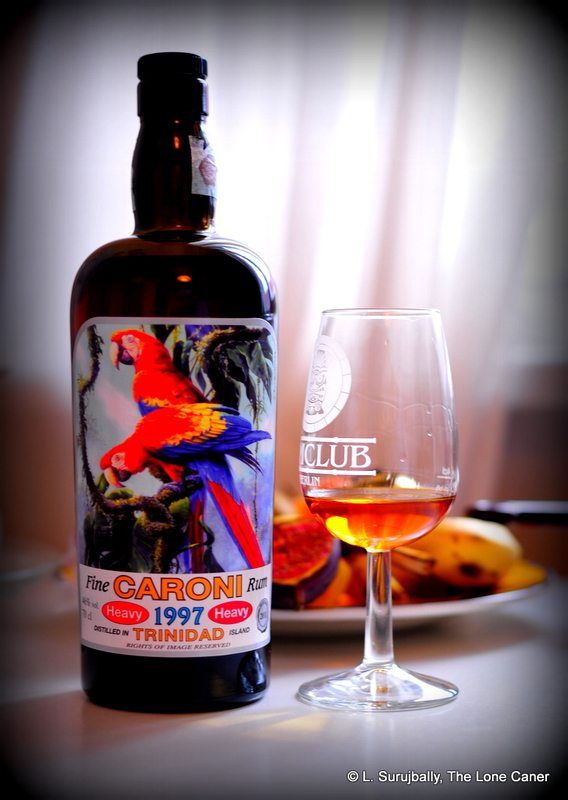 So for what I paid, I can’t tell you with a straight face that the Silver Seal Caroni 1997 is extraordinarily remarkable, an undiscovered masterpiece, a da Vinci among rums. But I can make the case that for the money you spend, you’ll have a fascinating and intriguing time…as long as you accept that the overall profile is less that of a well balanced rum than that of a smorgasbord of great individual bits and pieces, that somehow fail to communicate with the mothership.